My silence over the past week betrays the fact that I have been completely consumed by the preparation and launch of our new products at the speciality & fine food show at Olympia. What an amazing few days! I could moan and say that i haven't had a day off for the last 3 weeks, that every day has been at least 16 hours long and i have talked myself hoarse. On the other hand, I am so excited about the success of the show, the complete enjoyment of Monday's evening's affair at Fortnum & Masons (along with the opportunity to taste most of the other 3* Gold Great Taste award winners) and a wonderful evening spent with my foodie friend Kate, that I don't feel the slightest bit inclined to moan. In fact, it has been a blast! The strangest thing about the show was that I really found very little time to check out other producers. There was a wealth of new producers and products there and had it been a consumer show, I could have grazed from dawn till dusk. But there is something about being at a food show in a working capacity which does stop you taking advantage of every proffered freebie or morsel. So each lunchtime I found myself eating a salmon fillet and salad with my head in a book trying to block out the noise and frenetic activity going on all around me. By the time i got home after the final day and with a little time to rest, I was craving simple strong flavours and healthy home made food. You can imagine that the fridge and food shopping has been somewhat neglected over the past few days, so I was delighted to find a couple of ducks legs in the freezer, and with that, the makings of a hearty congee style dish. Bring the water up to the boil, then simmer the duck for 30 mins. 250g brown rice (I use Sainsburys brown easy cook italian rice as it has a lovely chewy texture and is higher fibre than normal brown rice). 1 tsp salt or 1 organic chicken stock cube - of course homemade stock is best but i didn't have any. 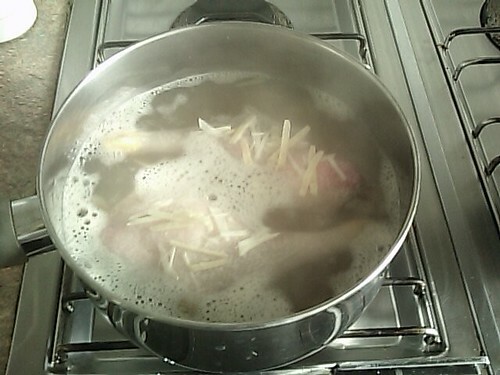 Stir, then position the ducks legs on top of the rice and leave to steam over a low heat for 30 mins. 15 ml tamarind & star anise jelly (ouse valley foods) if you can't find this, you can use plum jam instead. After 30 minutes, remove the cooked ducks legs and allow them to cool for a couple of minutes before drying the skin with paper towel. Put them in a ovenproof dish and spread over 2/3 of the sauce. Pop the ducks legs into the hot oven for 20 minutes. During the last 10 minutes, add some finely sliced courgette, peas and baby leaf spinach to the rice pan and leave to steam whilst the ducks legs roasted. Serve the crispy roasted duck leg on a mound of soupy rice and vegetables with a drizzle of the basting sauce to finish. I am sorry that I didn't manage to take a picture of the finished product, it looked so lovely, and I was so tired, I just had to dig in - forgive me!